If you’ve ever wondered, What does Jesus want to do with me? I’m about to tell you the answer. Jesus takes limited people and does limitless things through them. This is what He did then, and it’s what He will do now. We’ve been reading about the boy who gave Jesus his five loaves and two fish; and with those loaves, Jesus fed thousands. The bread could have been stale and the fish could have been fishy, but all that mattered was that the lad’s loaves were in the Lord’s hands. What we see as “not enough” becomes more than enough when offered to Jesus. So what does this look like in everyday life? Some of us are parenting teenagers right now. We’re looking at our kids and looking back at Jesus and wondering, Why did You ask me to raise this kid? It seems like I’m doing it all wrong. My child thinks I’m terrible, and I am struggling. Some of us are leading ministry and we are painfully aware of our inadequacy. We are limited and convinced our limitations limit our contributions to our ministry. Jesus knows this isn’t true. In fact, our limitations give Him room to demonstrate His power. Some of us are being asked to give generously, but all we can think about is our limited income. Listen, even if you have only a little, trust God. Put the gift in His hands and see what He does. Even crumbs can be multiplied when they’re offered to Jesus. Jesus, maybe I look around at my life and see only what I lack – time, money, talents, skills. Let me see my life through Your eyes. Let me see all this lack as the perfect space for You to show off. Thank You for inviting me to be a part of Your great plan. Amen. Find true comfort in God’s unwavering promises! Stuart, Jill, and Pete Briscoe want to show you how you can experience joy, hope, and peace even in life’s lonely seasons. 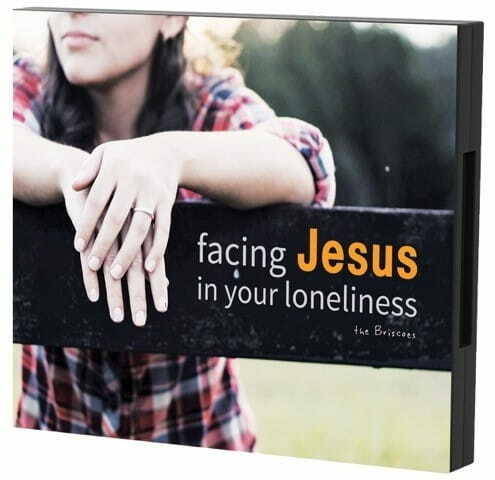 That’s why they want to send you their powerful 3-message CD series, Facing Jesus in Your Loneliness. It’s our gift to thank you for your donation to help broadcast God’s Truth to the world – so more people can experience Life in Christ!